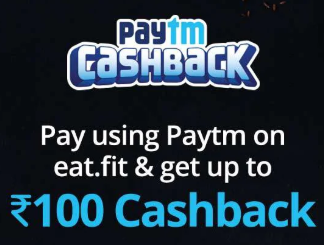 Paytm is offering flat 50% Up to Rs 100 cashback when you pay on eat.fit through your Paytm wallet. This offer is valid till 28th Feb 2019. How to Get 50% Up to Rs 100 Cashback when you Pay on Eat.Fit? Now click on pick for free. Then download Eat.fit app from Google play store. Now Order on Eat.fit and select Paytm. In this deal, you will get 50% Cashback up to Rs.100 when you pay using Paytm. Minimum transaction amount required to avail the cashback is Rs.99 and above. Offer valid five times per user only. Apply the Promo code at the time of checkout to avail the cashback. Cashback will be canceled in case of full refund or cancellation of the order. In partial refund cases, cashback will be rolled back in the same proportionate amount. Paytm solely reserves the right to change the offer terms at any time without any prior notice to the customer. In case of any dispute, a customer needs to get in touch with the Merchant/Brand. Cashback will be credited in 24 hrs from the time of transaction. According to RBI new guidelines, a user who has not undergone Paytm KYC will not receive cashback in their wallet.